Oh, wow!! I've never seen anything like these! How'd they go over at the office? Trick? Or treat? These are fun! Great Blog! Will definitely be back to look often! Super BLOG. 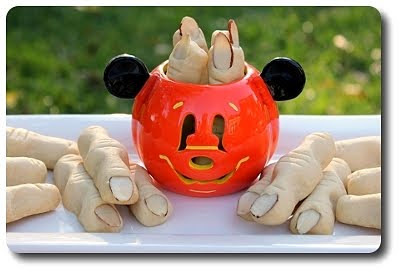 Glad to see you back again and these are perfect for Halloween. Spooky delicious too I bet. Looks like someone was an art major in the college years! Spooktacular! 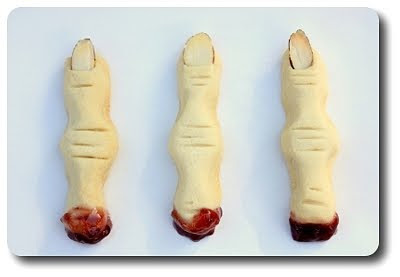 One of my friends made cookies that looked just like these but for her variation she dyed the sliced almonds red so the fingernails looked bloody. Ghoolish for sure!! Nice to see you back! These are cute and creepy. Have a good week-end! 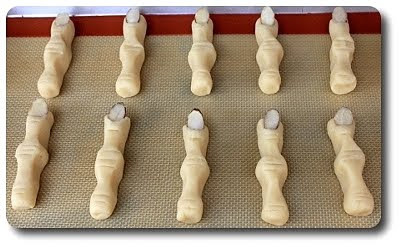 When I saw these all I could think of was--can you make a dog biscuit in this shape. Would be awesome! !